Just not long ago, the website optimizer Qubit have shared some interesting online insights regarding the travel industry to show how travel professionals can most effectively acquire customers. Let me share some parts of their sharing that I find interesting. What is the typical conversion rate for online travel booking? What devices are travel customers using to browse for travel product? 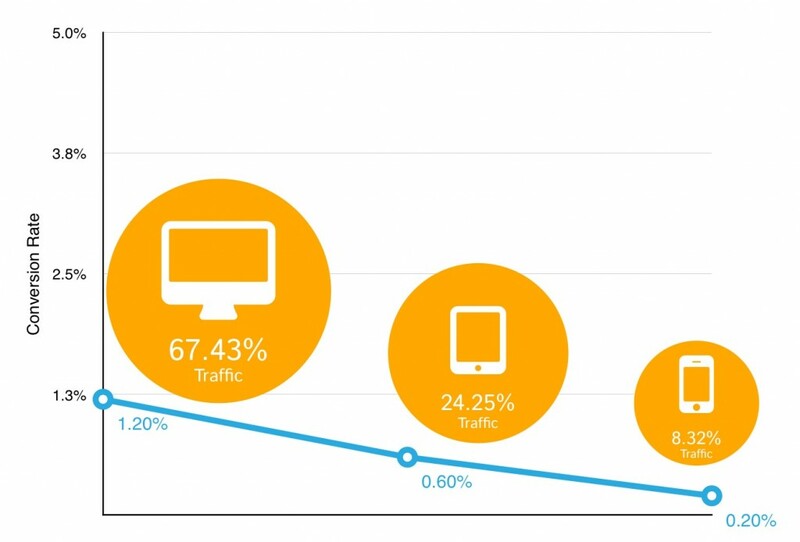 Tablets and smartphones make up nearly 33% of traffic reaching out to travel sites. Although these numbers might be different from site to site, but it exploits a huge potential for travel sites to start optimising websites for mobile devices. The optimised content of travel sites are critical in engaging and capturing the attention of visitors. Generally, there are about 75% of tour package purchase happening offline. Even this is the case, the other 25% of online purchase is growing rapidly. Travel companies still need to work hard to optimise the travel websites to achieve better sales conversion. Given that visitors are less accustomed to making large purchases on mobile, it explains the large difference in conversion rates. People are more accustomed to spending big on their computers. How long is the average online sales cycle in Travel? The average online sales cycle for travel product purchases can take about 13.2 days, with an average of 9.4 pages seen per purchase. What are the potential paths that visitors find travel companies? The path visitors reaching to a travel company could begin with paid search clicks and ends in organic search. In this case, the sales conversion result in high Average Order Value (AOV) travel products would be best. And while organic almost always closes the multi-channel path, another channel will have generated the initial interest that drove the user to search for that particular brand term immediately prior to conversion. From an AOV standpoint, paid search is the key driver in getting customers to spend more. Paths that start with paid search and end with organic are by far the most common paths and nearly the highest AOV. The reverse (organic to paid search) is less common, but results in the highest AOV of all multi- channel paths. The exposure combination in multi-channel paths that most quickly converts for travel marketers starts with a display view and ends with organic search. This path converts in an average of 10 days, which is half of the total average, despite its lower AOV. The slowest path begins with email and ends with display, taking an average of 49 days and has a low AOV. In fact, most of the slowest paths tend to involve email, regardless of whether it is at the beginning or end of the sequence — these paths also have a 36% lower AOV when compared to other multi-channel paths. With the right combination of media, the average order cycle drops considerably. Multi-channel paths leading with display tend to convert users the fastest. Figuring out the right types of display targeting is crucial to leading a user to search for a particular brand and getting them to finally buy it. The average order value decreases considerably when a user views or clicks on a display ad and then clicks on a search ad. Re-marketing or retargeting customers is likely contributing a great deal to higher AOV purchases by showing ads to users who have already expressed interest by clicking on an organic search result or a paid search ad. However, the average order cycle for these types of conversion paths is generally much longer. Messaging and timing are crucial in not only getting a particular user to convert, but in getting them to convert more quickly, hence saving money. Drilling into all types of channel paths to figure out what is driving users to purchase more (or less) is essential to improving efficiencies cross-channel. Therefore having the ability to track media and optimize based on the partial credit from each and every touch point in the exposure path to conversion becomes crucial piece of the feedback loop. 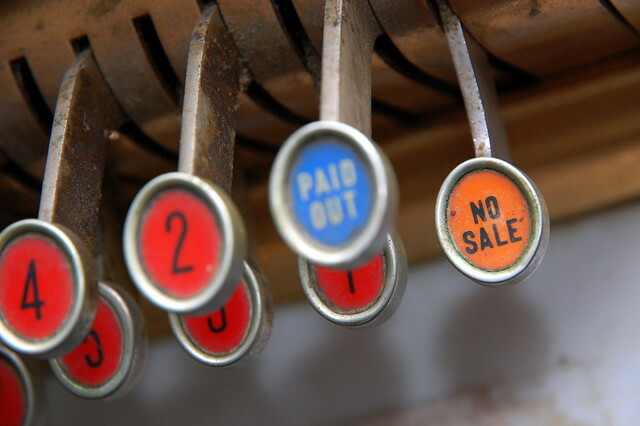 Are you dividing and tracking all your sales and marketing channels well? 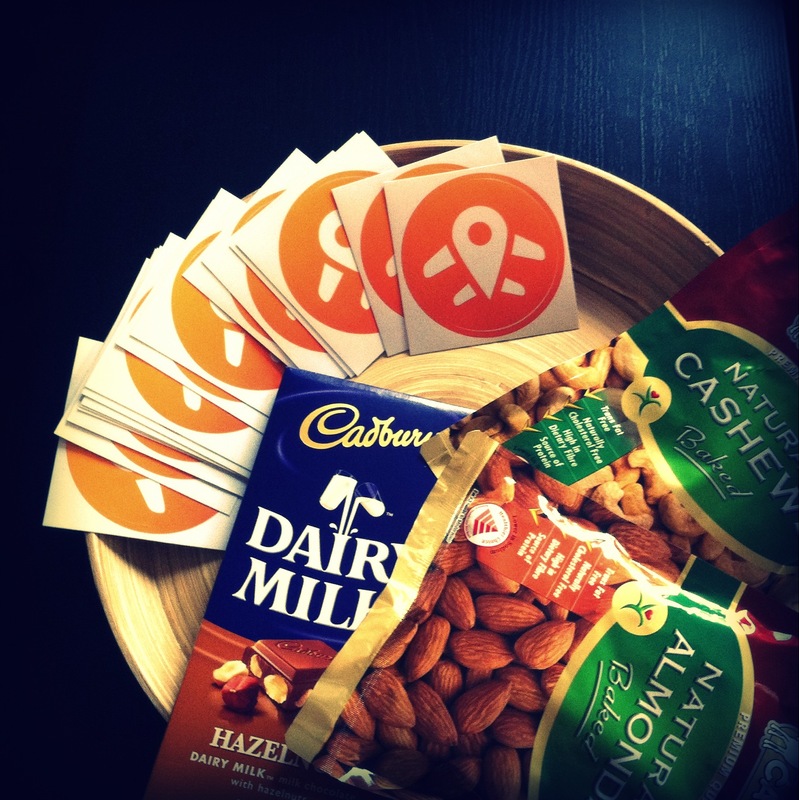 Moving from offline to online marketing requires lots of work and insights too. Feel free to drop us a mail, we’d be more than happy to share more with you! This entry was posted in Insights, Travel Agency on April 4, 2014 by flocations. As expected by most of travel agencies, the turnout of NATAS Travel Fair continues to be attracting disappointed foot traffic. With almost the same traffic as last February, travel agencies are seeing significant drop in sales revenue despite all the jawdropping promotions and deals. NATAS Travel Fair in February 2014 invited total of 54,275 visitors over the three-day fair. Estimated overall sales volume to be approximately S$80 million, lower than the estimated $85-90 million in February 2013. During the NATAS Travel Fair, there are these 5 long haul destinations which top the list of niche places that travellers going to – Turkey, South Africa, Russia, Eastern Europe and Scandinavia. Meanwhile, the usual popular destinations that people buy during NATAS Travel Fair would include China, Europe, Japan, South Korea and Taiwan. If you happen to miss the travel fair, take a look at the travel packages that travel agencies still offering. Mail to us at [email protected] if you want to post any of the relevant packages above! This entry was posted in Events, Travel Agency on March 8, 2014 by flocations. De-risk your business – only pay for marketing that works! Let’s face it, marketing is sometimes a gamble. Spend $4,000 dollars on that Straits Times ad in the wrong travel season and you’re not eating next month. But SPH won’t take responsibility for your poor results. In fact, they are sitting back and spending that money on expensive whiskeys while you’re scratching for sales. Straits Times won’t take responsibility for their performance. Isn’t it time the did? Wouldn’t it be great if you call up Straits Times and say “if you manage to bring me 100 customers this month, I will pay you $4,000″. They will laugh in your face because that puts the risk on them. Well, Performance Marketing is willing to take on ALL of your risk. Performance marketing is results-based marketing. Meaning that you only pay for real results! Why blindly spend money on marketing that might not work? Why not spend money on marketing that is guaranteed to work. If it doesn’t work, you don’t pay! This means that the marketing channel takes on ALL OF THE RISK! This is the beauty of performance marketing, it not only de-risks your company but performance marketers are cutting edge thinkers. They will risk it all to try a new channel. Facebook, Youtube, Pinterest, Tumblr, Bing, Google – seriously, you don’t have the time nor the skills to try all of these channels. That’s where an awesome performance marketer comes in – they will try all of the crazy channels to get you the best results but you only pay if you get results! So either gamble $4,000 to maybe get some business or make a smart investment in performance marketing platform like Flocations to GUARANTEE that you get what you pay for! This entry was posted in Travel Agency on January 16, 2014 by Flocations. “With consumers becoming more and more travel savvy, demand for travel has significantly increased in tandem. NATAS is also constantly in the process of exploring new business opportunities with our members so as to cater to this demand.” boasts Robert Khoo, ex-CEO of NATAS circa 2010. Mr. Khoo’s statement, although still true and arguably stronger today, the viability of NATAS as a marketing channel is becoming questionable as consumers are using online sources to find their next trip. 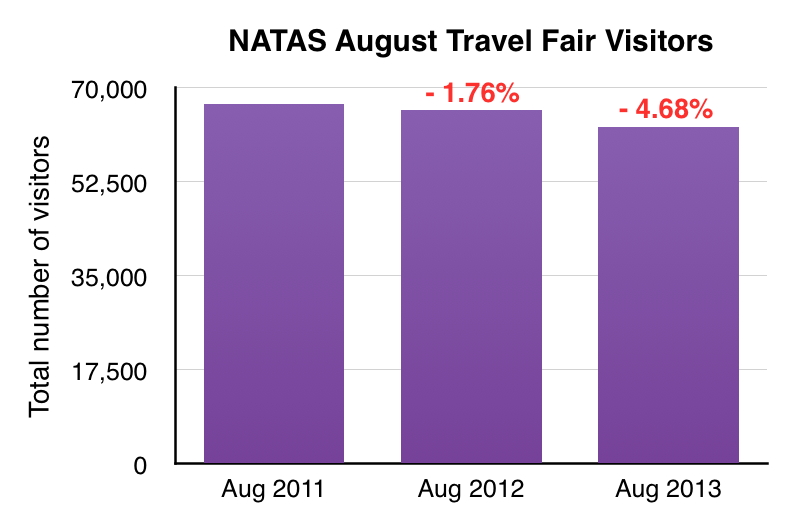 Since 2011 the total number of visits to the NATAS Travel Fair has been decreasing and disappointing many travel agencies. 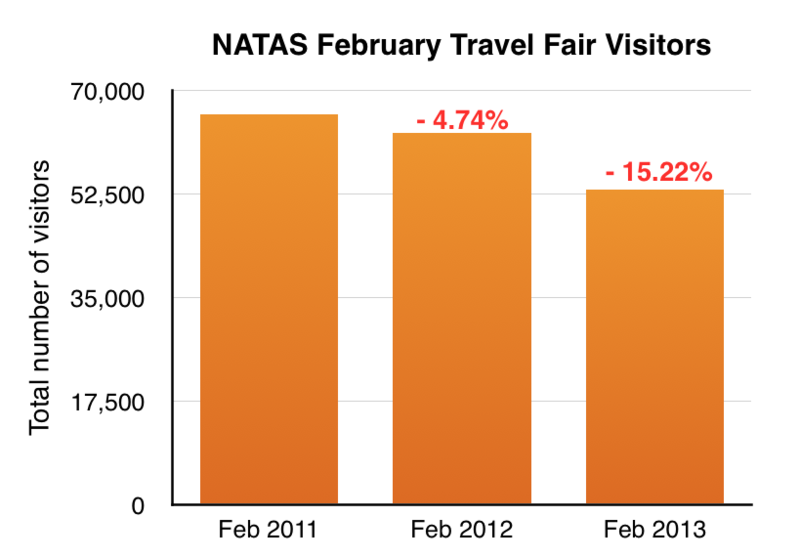 NATAS’ annual February Travel Fair, has seen 15% drop in visits since 2012. In fact, February numbers indicate that the importance of the fair is starting wane for consumers who are starting to move to other sources of packages. The most recent NATAS fair organized in August 2013 drew 62,744 visitors, a drop of nearly 5 per cent from the 65,822 in the previous year. Bookings slipped more than 9% to an estimated $98 million, from the previous year’s $108 million. Yet, NATAS is still very positive and actively promoting its “NATAS Accreditation” framework. 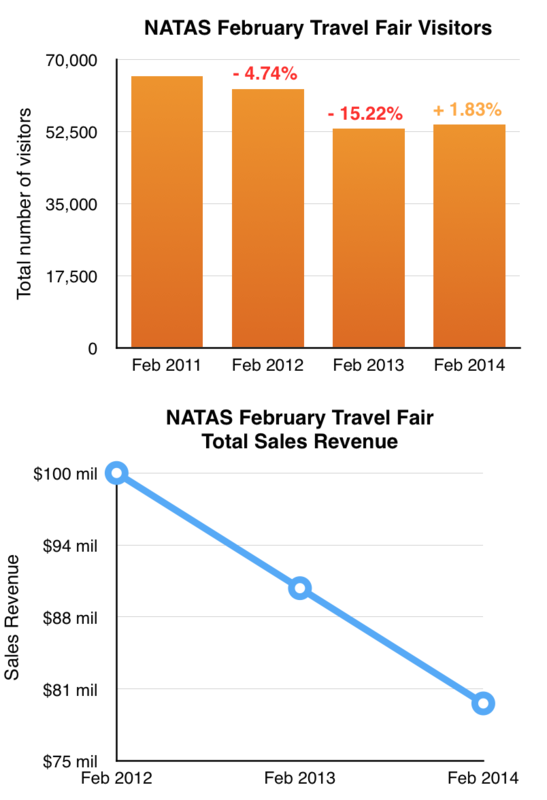 In order to take advantage of the once vibrant foot traffic that NATAS promised, many travel agencies would rely solely on the NATAS Travel Fair to get their deals to the public. However, the over reliance on NATAS Travel Fair channel to get these sales has pigeonholed many travel agencies’ business expansion as consumers are moving quickly to online sources to make their travel purchases. Scornful quotes started to appear to doubt NATAS’ long term value. Here is one, quoted from an online blogger. This entry was posted in Travel Agency on December 17, 2013 by Flocations. We all have problems every day in our lives. And the key is to prioritize and solve them. Let me pick 3 high priority problems that are endangering the life of Travel Agency and the remedy to solve them. These problems, of course, are all related to the online market and they can all be solved. How do you find and target your potential online customers? The online world is quite a mess. But there are a few sources that could help you to filter your online audience so that you could target acquiring them. One way is to scan through some foreign travel forums and identify if they meet your customer demographics. Or you could spend a five-figure amount to hire a search-engine-optimisation-expert to improve your search ranking while waiting anxiously for sales. You may also be acquiring potential customers through your online social channel (Facebook, Twitter). But to cover the fundamentals, travel agencies should also consider online package listing website that could help travel agencies to boost their potential online sales. One of the online classified package listing website would be Flocations.com. Flocations help travel agency to get rid of dumb traffic that are just “click for fun” from Google or anywhere else, and send them to you as a potential customer. They are the ones that interested in your travel package offering. More importantly is, your potential customer will spend most of their time on your website once you acquired them. This is building your brand awareness. Look at how we can help you? Is it normal after you set up a website and get no sales from there? Definitely not! Else, why you spend your few thousands dollars setting up the website? 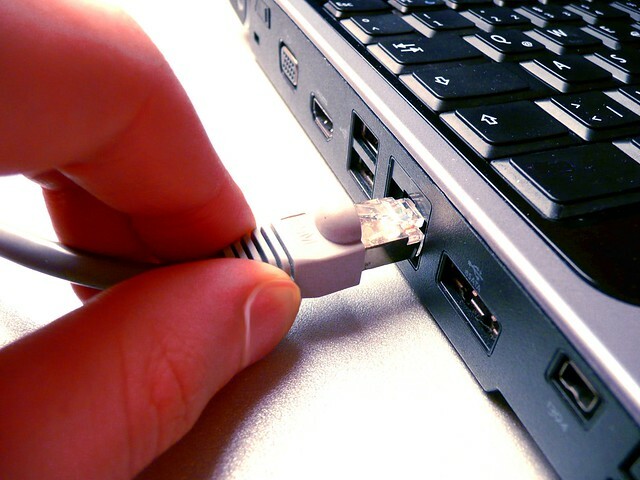 Many travel agencies tend to rely their online sales on flash deal site channels like Groupon or Deal.com.sg . This, in fact, will only make flash deal sites to always have upper hand over you. And it does not make your website worthwhile for that thousands of dollars spending. There are many other channels out there that could help to increase your potential sales, and Flocations is proud to be one of those channels unique enough to promote your website, travel package, deals and promotions. If this statement is true, all the online advertising will be dead. I guess that’s why become your worry, “Why am I spending thousands of dollars every month but does not seem to see any effect?”. Firstly, if you think about how many ads you are seeing everyday, you will understand why online ads should be a long term strategy for your business with consistent long term investment. This is to build the brand awareness for your travel agency. Second question to ask is, what is your advertisement purpose, and are you measuring it well? Even final goal of setting up ads is to get sales, there are broader purpose and bigger vision than that. 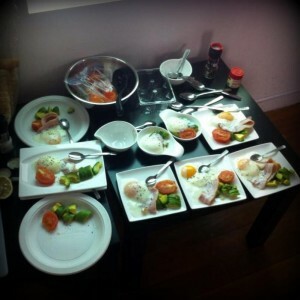 And if you are not measuring well, you could not conclude it’s useless. To optimise for online advertising to get meaningful online users, we are here to solve the “How” for travel agencies. For starters, travel agencies should set up a website analytics system. This is to help travel agency to track your website performance and conversion. The tool we use is Google Analytics. I’m happy to set it up FREE for you without any terms and conditions. Just email me your enquiry at [email protected] . Why Groupon is not the long term strategy for travel agency? Is any of the flash sales sites like Groupon becomes your main revenue source? Travel agency business might be endangered when their business model started to build upon flash sales sites. Besides ruining your brand awareness in the long terms, following are the deeper problems that travel agency might not be highly aware of. Typically, travel agency (client) negotiates with Groupon (or other flash sales sites) on contractual terms to pay the travel agency (client) within certain guaranteed short period of time after a deal had been redeemed with the travel agency (client). But, sometimes flash sales site (Groupon) might delay the payment for a long period of time. And this delay would cause cashflow problems for the travel agency (client). This is not a new case, we saw this happened earlier in the year when Groupon faced a S$290,000 lawsuit filed by Villas International. If you were not the similar victim, be prepared. Most of the time, customers generated to Groupon’s client (travel agency) are Groupon’s loyal customers. In other words, they are cheap deals loyalists. They might choose other travel agency’s deal over you some day, when you weren’t offering any cheap deals. And to secure this customer, travel agency needs to line up a series of cheap deals to always win them back. This, in the long run ruins profit margin for travel agency and of course eroding the business in the long run. We all know Groupon or other similar local flash sales sites might have larger customer database than travel agency. And being popular and offering guaranteed sales service, Groupon has better bargaining power in choosing which travel agency (client) to be featured on the platform. The exclusivity offer with Groupon hurts travel agency as travel agency needs to slash a big discount and only can market through Groupon channel. Other flash sales sites work in similar model. Therefore, to acquire more customers in a safer way is to redefine the unique proposition of your travel agency again, and start market through offline and online channels. Online branding and marketing to generate potential sales is not a new thing today. Online advertising channels like Facebook, Google ads offers very comprehensive coverage to acquire new customers. But to be professional takes time, which is why many online advertising agencies are out there to help. But to cover the fundamentals and start with the lowest marketing cost, we believe online classified listing websites would be a very viable options for travel agency. Let us know if you interested to know more, this link here basically covers the basic. This entry was posted in Travel Agency on December 9, 2013 by Flocations. Travel agencies in Singapore might be doing very well. But that might be the past. I’m sure it’s getting harder to penetrate deeper into the growing travel market now due to the insane technological change in recent years in addition to SPH’s losses in readership. We all feel that travel agency market has been shrinking. Well, you’re partially wrong if you’re not flipping the coin to see the other side. The overall travel market is actually growing, but travel agencies have been following the obsolete model that does not grow into the bigger market - the online travel segment. According to Google, 72% of tour package buyers are using online as their first source for more information. And from their record, there are 3 MILLIONS search queries related to tour package research. Have you done anything to capture this market? Check out the few articles below that I find truly inspiring. This entry was posted in Travel Agency on November 28, 2013 by Flocations. 7 JULY 2013- SINGAPORE – Flocations Pte Ltd (www.flocations.com), a Singapore based startup that enables metasearch for travel packages, has appointed an all-star Board of Directors from the travel industry. Kei Shibata of Venture Republic and Shirley Wong from TNF Ventures join as Directors, and Jixun Foo of GGV Capital joins as Advisor to the Board. Under such direction, Flocations.com aims to push the boundaries for online travel planning with new and innovative approaches to the sector. Shibata says “Flocations is a new breed of online travel company. Their ideas and technology give me confidence that they will provide the most innovative travel search service, starting with aggregating travel packages available online”. Shibata co-founded Venture Republic Inc., a public company in Japan that owns and runs Japan’s leading online travel search engine, “Travel.jp” as well as a user generated online hotel review service, “Hotel.jp” and a comparison shopping engine, “coneco.net.” The 3 Venture Republic websites attract more than 15 million visitors each month. Shibata began his business by bringing offline travel agents into the online field, an experience that is invaluable to Flocations’ core business and will help with their international expansion. Jixun Foo is an investor in China’s leading online travel company Qunar.com and is the Managing Partner of GGV Capital. Foo says, “Online travel is fast growing and still has massive potential in Asia, as only 20% of travel is sold online. In addition, mobile is changing the way consumers consume travel. What I like about Flocations is their ability to consolidate travel package inventory that is not even online yet and couple it with inventory that is online, which ultimately reduces friction between users and service providers”. For the past 12 years Foo has been a venture capitalist, investing and working with Asian entrepreneurs. His interests are primarily in the Internet and Mobile sectors. He is a board member on the boards of Qunar, Youku-Tudou (NYSE: YOKU), MediaV, and Douguo. He is also very actively involved with Meilishuo.com, UCWeb, AAC Technologies (HK: 2018), Chaoli and Meihua (600873.SS). Foo ranked 11th on “The Midas List 2007″ by Forbes, has been annually awarded one of “Best Venture Capitalists” by Forbes China since 2006. In 2012, he was recognized as one of the Top 10 Venture Capitalists by Zero2IPO and also named to the 2012 Venture Capital 100 by Always-On. Shirley Wong takes an operational approach to the business. She says “Flocations’ business is very scalable and that’s key to centralizing in Singapore and easily expanding throughout South East Asia”. Wong is the founding Partner of TNF Ventures. Shirley Wong is an entrepreneur with more than 20 years of experience in the IT industry. She co-founded Frontline Technologies Corporation Ltd in 1994, and it was listed on the Singapore Exchange in March 2001. British Telecom Global Services acquired the company and subsequently renamed it BT Frontline Pte Ltd. Shirley is active in the start-up scene working with a number of start-ups to help them secure funding, access resources, build market connections and go to markets. She is incredibly passionate about entrepreneurship and is excited to help build the start-up community in Singapore. To date the company has concentrated on meta-search for the travel industry and only recently ventured into the business of search of online travel packages. ”Travel packages are the last bastion of offline travel” says Shaw Chian, the technical co-founder of Flocations. “Our clear success shows that bringing travel packages online is working”. In the last 2 months, Flocations has had 125% organic growth month over month and the site converts 10% of visits to sales leads for their partners. 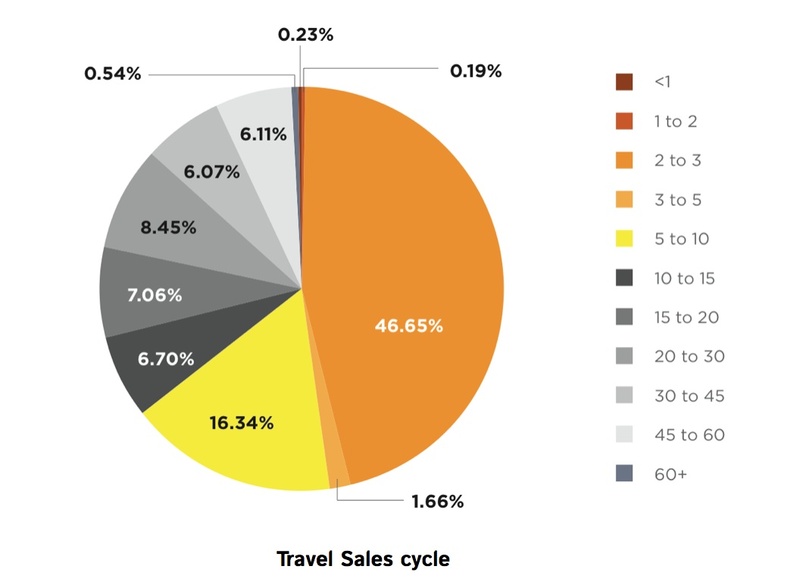 In June 2013, more than S$1,500,000 worth of sales leads were sent to local travel agencies. Flocations Pte Ltd is a Singapore based travel technology company that concentrates on bringing travel packages online. 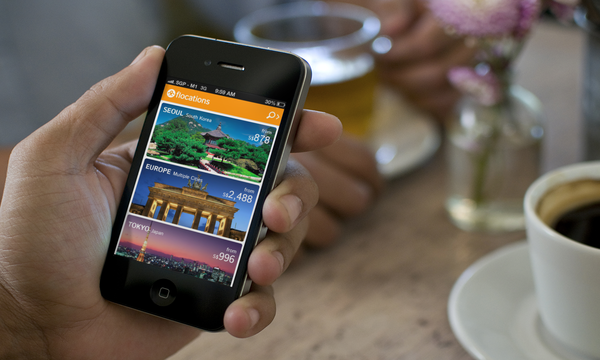 Flocations’ vision is to make it easy for anyone to find their next trip on any device. During the month of June 2013 alone, Flocations sent more than S$ 1,500,000 of booking requests to its partners. 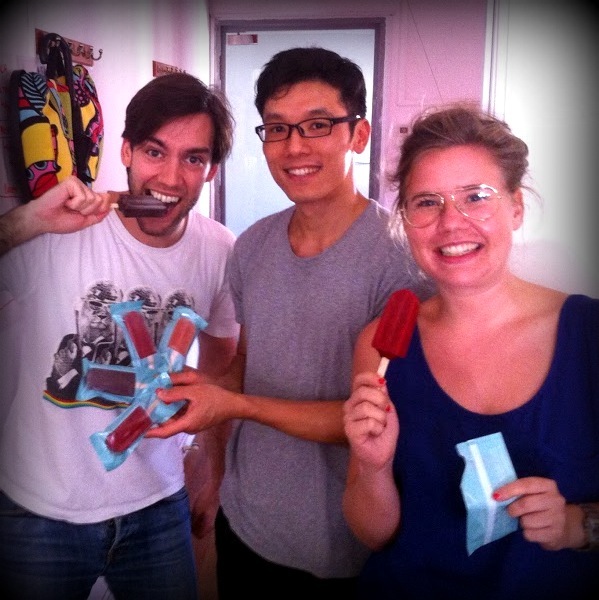 In December 2012, Flocations closed a pre-series round of funding, raising S$700,000, led by TNF Ventures. The investment is supported with additional capital from SingTel Innov8 and Singapore-based business angel Ben T Ball. This entry was posted in PR, Travel Agency on July 7, 2013 by Flocations. 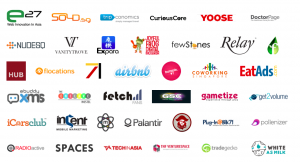 Walkabout is this awesome event where dozens of startups open their doors to visitors. This year’s Walkabout is on Friday, May 17th, and Flocations is of course one of the participant. Not that we close our doors the rest of the time (we always welcome travellers to come and share their travel experiences or needs with us). We will do it right with a selection of international beers, a secret monk-made spirit, singapore-made popsicles, and even perfect 64C sous-vide eggs. That’s what we get with our no-2-same-nationalities team! We will also tell visitors about our current job and internships openings. Because getting a job is always better with a beer in hands. See you Friday, May 17th, from 12pm to 5pm, at our office: 61B Duxton Road, above the massage parlor. 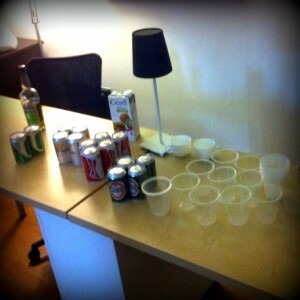 (After 5pm, it will be all about the after-parties. 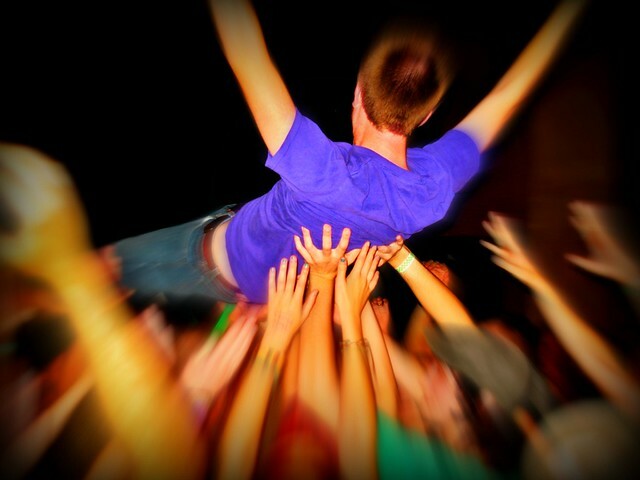 This entry was posted in Events, Travel Agency on May 14, 2013 by Flocations.